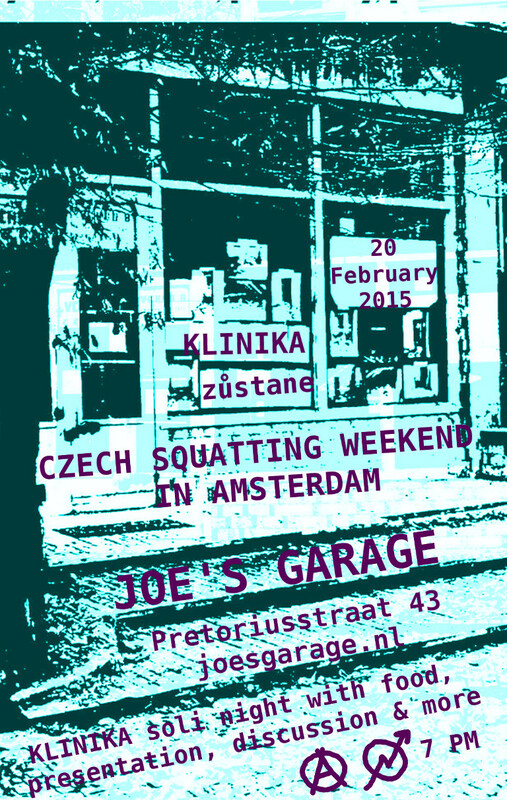 Czech squatting weekend in Amsterdam, February 20th – 22nd 2015. Klinika on tour! 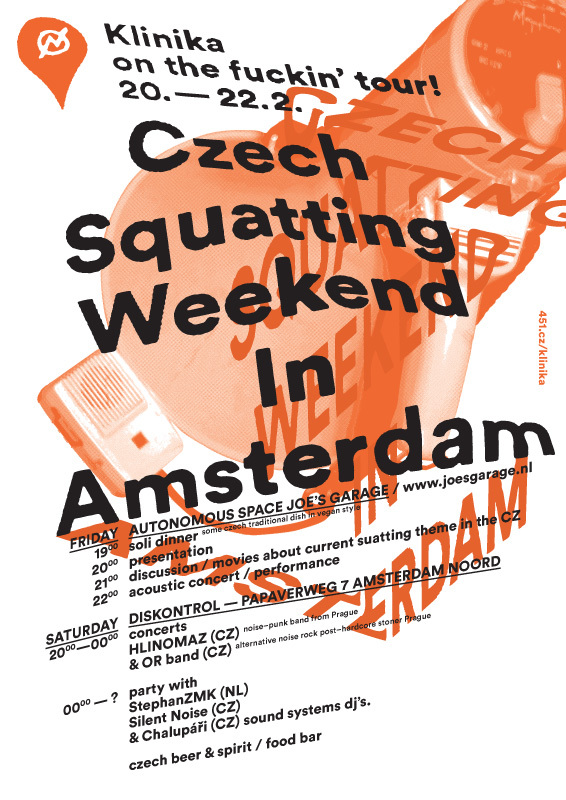 Some members of Czech squatting movement are coming to Amsterdam to present and discuss about the actual breakthrough in the squatting movement in Czech Republic. On Saturday, November 29th, an abandoned building of a former clinic in Prague district of Žižkov was occupied by a group of activists. Cleaning works, reconstruction and program started immediately. Despite widespread support, including neighbors, politicians, artists, journalists etc., the owner of the house – Office for Government Representation in Property Affairs – withdrawed from negotiations. Regarding to some sources, the “anti-extremist” department of Czech police played an important role in this decision. Autonomní sociální centrum Klinika (Autonomous Social Centre Klinika /Clinic http://451.cz/klinika/ ) was evicted December 9th after ten days of struggle and hundreds of people participating. Spontaneous demonstrations immediately took place in front and inside of Žižkov city hall and in office of the owner. After a few days, one thousand people demonstrated in support of the autonomous center. The building is now being guarded, but the struggle isn’t over yet. Žižkov councilors agreed that they will start negotiations with the state. 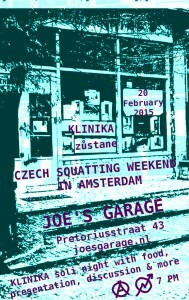 The public support of squatting is now the highest in Czech history. The ministers of interior, finance and social affairs publicly admitted the possibility of decriminalization of squatting. We, as a group supporting a project of social centre, are calling for international support! A pressure on Czech state can help us to create a historical success. Every city needs it’s clinic!